We at Barista Del Caffe are passionate about great coffee. We want to enjoy the highest quality coffee at home, just as you do. That’s the very raison d’etre for this website. If you’re a lover of freshly ground coffee then bean to cup coffee machines are probably one of your favourite inventions. But when investing in a machine, you want to be sure that the one you choose will always produce top notch coffee. That’s why we created this guide to Melitta coffee machines. If freshly ground coffee beans are your thing, but you don’t like the hard work associated with traditional coffee making, the bean to cup coffee machine is perfect. Simply turn on your machine, press a button or two and voila, you have great fresh coffee. What could be easier or better? Even within just the Melitta range, bean to cup machines can range enormously in both functionality and price. With so many options, choosing the right one for you can seem like an impossible task. So, at Barista Del Caffe we decided to help make it easier for you with this easy guide. What’s in our Melitta guide? Melitta is one of the most recognised brands in the market. It’s not surprising given that they’re one of the original coffee machine makers. That’s why with Melitta you can be sure that you’ll always be served top-notch coffee that hits your caffeine spot. So this guide looks at the range of coffees each machine makes, ease of use, functionality, advanced features, how easy they are to clean, and real-life feedback about each machine. We know that everyone has their own coffee preferences. But whatever your taste, one thing remains the same: you want to be enjoying the best freshly ground coffee. But perhaps you prefer a latte to an espresso; a cappuccino to an Americano. As each Melitta machine is different, with different functionality, this guide will help you choose one. While, in terms of quality, we would recommend every Melitta machine included here, not every one of these machines will be the right choice for you. Your favourite coffee type, the functionality each machine offers and, of course, budget, will all influence which is the right option for your home. Budget is a consideration for most people, and these Melitta machines range in price from a little under £300 to over £600. The cost indication below reflects the price in comparison to the cost of the other machines on the list, and without any discounts included. Melitta is a well-recognised name in the coffee machine market. Known for quality, it’s not surprising that the original Melitta Caffeo Barista scored consistently highly in the bean to cup reviews for a number of years. The TS is an upgrade on that machine, and it’s easy to see why this version of the Barista is doing just as well. The Melitta Caffeo Barista offers users a far more than adequate 21 preprogrammed coffee options. Although marketed as more of an espresso and lungo machine, its cappuccinos, latte macchiato and caffe cremes are just as good, thanks to its high quality integrated milk frothing system. And it can even produce cold lattes and chai. This Melitta is very simple to use. The touch screen buttons clearly indicate the coffee you’re choosing, while the colour TFT screen couldn’t make it easier for you to understand exactly what you’re getting. Adjusting the settings is easy too thanks to the ‘Touch and Slide’ system, which allows you to set everything from strength and length to temperature. Four individualised recipes can be stored. . Many of us coffee lovers like to change around our beans depending on our mood. Traditionally, this would mean having to empty out the bean hopper, which can be fiddly. This bean to cup machine has a double chambered, airtight bean hopper, which allows you to store two different bean types at once. Just select which hopper you want to brew from. ow easy is it to clean? With its automated descaling, rinsing and cleaning programmes, this Melitta Caffeo Barista is simple to keep clean. It even reminds you to rinse the milk pipe after every use to keep it hygienically clean. The only criticisms of this machine are pretty minor. Some report that the manual isn’t the easiest to understand, and you might need to refer back to it for the more advanced features. Another reported issue is that the length of the drip tray makes it difficult to empty without spillages. The Melitta Caffeo Barista isn’t the cheapest bean to cup coffee machine on the market but, for the price, you’re getting a whole load of functionality in a stylishly elegant package. As a well-recognised name in the coffee machine market, it should be no surprise that the Caffeo Bistro is a bean to cup machine that boasts a four-star rating on Amazon and has regularly appeared around the top of the most recommended lists for a number of years. The Melitta Caffeo Bistro offers two preset coffee options: espresso or double espresso. With a professional level 15 bar water pressure, users can be confident that every cup of coffee will feature a rich, thick crema. The integrated steam wand is specifically designed for creating the rich, thick frothed milk needed for cappuccino thanks to the inbuilt milk whisk. This Melitta is simple to use thanks to the intuitive interface. The four buttons are clearly marked with the strength options, plus double or single options, and the steam wand power button. Two dials control the length and the steam wand. Checking the strength you’ve selected is easy thanks to the four coffee bean shaped lights. As with many Melitta machines, the Bistro features an airtight double chamber bean hopper that enables you to store two different bean types, so you can enjoy different coffees whenever you feel like it. Cleaning the Melitta Bistro is simple and fuss free thanks to the automatic descaling, rinsing and cleaning programmes. Some cleaning does require manual intervention but the machine handles much of the daily maintenance unaided. This Melitta is marketed as an espresso and cappuccino machine primarily, and that’s what it does well. However, it’s up to you to manually froth the milk, and some users report that the steam wand is slow to heat milk. Others find the integrated whisk unnecessary and would prefer to be able to use the frother without it. If you’re an espresso or cappuccino fan, then the Melitta Caffeo Bistro should definitely be on your consideration list. However, if you’re looking for a wider range of automated coffee types, then this isn’t the coffee machine for you. Founded in 1908, with over a century of coffee making experience, it’s not surprising that Melitta is well-recognised name in the coffee machine market. The E970 Caffeo CI is yet another quality machine that boasts an impressive 4.5 stars on Amazon and other retail sites. With four preset coffee options, the Melitta E970 Caffeo offers users cafe cremes, cappuccinos and macchiatos that are of an equal quality to its espresso. This is thanks to its 15 bar water pressure that produces rich, thick crema, and it’s high quality integrated milk frother that ensures luxuriously frothed milk every time. This Melitta is a doddle to use. The range of buttons are clearly labelled with the coffee types, water or steam options, plus the choice of bean hopper and two cups. The black and white TFT screen makes knowing what you’re getting simple too. Should you be the kind of person who likes to switch your coffee around, or perhaps share a home with someone who prefers different beans from you, this Caffeo is ideal. It has an airtight, double chambered bean hopper, which can store two different bean types. When making coffee, simply select which bean hopper you want to use. Cleaning this Melitta is simple and easy thanks to the automated descaling, rinsing and cleaning programmes. Even cleaning the milk pipe is straightforward. And the TFT screen guides you through the process. Not really. Some users complain that the drip tray needs emptying pretty frequently, but that’s a very minor criticism. Perhaps, for a bean to cup machine that includes an integrated milk frother, it could offer a wider range of coffee types, but that’s down to personal preference. The Melitta E970 Caffeo CI is a versatile machine that enables users to enjoy quality coffee with minimal fuss. It doesn’t offer the widest range of coffee types, but that’s easily rectified thanks to the My Coffee menu. As a well-recognised name in the coffee machine market, Melitta has a reputation for producing high-quality machines that deliver on their promises for over a century. The Melitta E-953-101 Caffeo Solo and E-953-102 Solo and Milk are no exception, Despite being an entry-level bean to cup machine, both score an impressive 4.5 star rating on Amazon and other retail sites. Marketed as an espresso machine, that’s exactly what the Melitta E-953-101 Caffeo Solo does, with Americano as a variation. Meanwhile, the E-953-102 Solo and Milk is the equivalent cappuccino machine with an inbuilt manual milk frother. Thanks to their professional level 15 bar water pressure, both produce high-quality coffee with a rich, luxurious crema. Both also feature Melitta’s Aroma-Satisfaction system, which guarantees the best taste extraction. Both feature very simple interfaces that have just three buttons and two dials, making these bean to cup coffee machines simple to use. Everything is clearly labelled for intuitive use. Despite being entry-level machines, these devices offer surprising functionality. Every aspect of your coffee is controllable. The intelligent conical steel burr grinder has three settings. The strength, length and temperature are all easily adjustable. In addition, Melitta provides a Companion App that gives you tips and hints on how to make the most of your machine for the highest quality coffee. With their automated descaling, rinsing and cleaning programmes, the Melitta Caffeo Solos are simple to clean. The Companion App has detailed instructions on how to use the programmes. If anything, some users report that they’re a little too keen on cleaning themselves. The Solo is an espresso machine, and that’s what it produces. For milky coffee lovers, it’s worth investing in the Solo and Milk but, even then, you’ll need to learn how to use the manual steam wand. For entry-level machines, the Melitta E-953-101 Caffeo Solo and the E-953-102 Solo and Milk offers a good level of functionality and controllability. If espresso or Americano is your thing, then both are great choices. However, if you prefer milky coffees and don’t want to hone your barista skills, then this isn’t the machine for you. Why buy a Melitta Coffee Machine? Founded in 1908, Melitta has been making high-quality domestic appliances for over a century. Coffee has been a particular passion of theirs since the beginning. That’s over a century of ensuring that coffee lovers can enjoy their favourite barista-style coffee in the comfort of their own home. Innovation underpins everything that Melitta does. Therefore, you shouldn’t be surprised to learn that Melitta was responsible for the invention of the coffee filter. Something we coffee lovers should all be grateful for! If you’re looking for high quality, reliability, and the most delicious freshly ground coffee, Melitta should definitely be on your shopping list. All of the machines covered in this review are bean to cup machines. Bean to cup machines contain a lot of technology. Therefore you’ll be looking at spending at least a couple of hundred pounds, even with some of the big discounts that you can find from some retailers. As a true coffee lover, you should consider it an investment in your passion, that will pay off over time compared to buying coffee from your favourite coffee shop. Freshly ground is the best way to enjoy the highest quality coffee. But traditional methods of making freshly ground coffee are time-consuming, messy and fiddly. A bean to cup machine removes all the mess and fuss, for the freshest coffee with no hassle. With their intelligent grinders and professional 15 bar water pressure, these Melitta coffee machines guarantee the best quality coffee around. What to look for when choosing a machine? Bean to cup machines vary enormously in functionality, features, and price, even within the Melitta range. When choosing one, you need to make sure that the machine that you select does what you want it to do. If you don’t, you’ll end up regretting your purchase, and you’ll probably find it gathering dust rather than it being a vital part of your kitchen arsenal. So what considerations should be on your list when choosing your ideal Melitta bean to cup coffee machine? The cost of bean to cup coffee machines can vary enormously. From hundreds to even thousands of pounds. The Melitta machines we compare here range from a little under three hundred to over six hundred. That’s a big difference for most people. Before comparing machines, make sure you have a budget in mind. There’s no point falling in love with a shiny new coffee maker, only for it to be way out of reach financially. However, it’s worth having a little flexibility in your budget if you can, as you might get a whole more functionality for not that much more money. We live in a digital age and, for consumers, that’s a great thing. Manufacturers and their advertising will only ever tell you how amazing their products are. Sometimes even professional reviewers will be swayed by free products. That’s why it’s worth checking out what people who have used these machines in real life think of their purchases. Retail sites, such as Amazon, are the ideal place to start. The lowest reviews, those with one or two stars, are the best way to find out about any common issues. While there may well be some complaints that are too ridiculous to take seriously, there will also be genuine ones. Look for any patterns of common complaints. Even the higher star ratings may well reveal some home truths about the machines. Things such as noisy grinders, or a frequent need for cleaning, for example, might be mentioned amongst all the positive stuff. Given that the whole point of investing in a bean to cup coffee machine is to enjoy freshly ground coffee without any hassle, ease of use is important. Again, there’s no point buying a machine that ends up gathering dust because it’s just too much work. Do you want a machine that does everything for you? Or are you prepared to discover your inner barista and learn how to use a steam wand or milk frother for making your own lattes, cappuccinos, flat whites or macchiatos? This is something you need to consider when deciding which machine is for you. Cleaning coffee machines. Ugh! Traditionally a fiddly and time-consuming – but necessary – job. It’s something that no-one enjoys doing. Regular descaling is particularly important, as is keeping the steam wand clean. Luckily, the Melitta bean to cup coffee machines all have automated cleaning programmes, which make keeping your machine in good working order easy and fuss-free. In most cases, even cleaning the steam wand is a simple process. Your preferred coffee type may well dictate which machine you opt for. It all depends on how much work you want to do before you enjoy your coffee. That’s especially important if milky coffees are your thing. 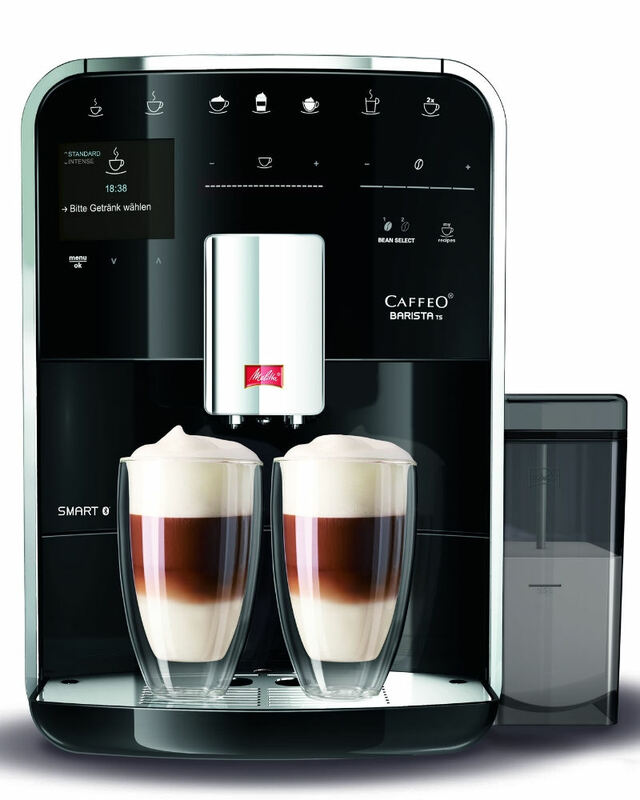 Do you want to wait for your latte macchiato to be delivered with no more input than pressing a button? Some machines only make espressos, so you could be disappointed at the lack of functionality, and how much you need to do to get your coffee. Perhaps controllability is your thing. Are you really particular about how you like your coffee served? Strong or weak, long or short, how do you take yours? Do you want to be able to set your preferences and store them? Or are you happy to work with the factory settings? Whatever your requirements, this list of Melitta coffee machines has one that will meet them. If the grind isn’t right, you won’t get the most enjoyment out of your coffee. The Melitta range includes what it describes as ‘intelligent grinding’. The conical burr grinders react to the feel of the beans as they grind and adjust accordingly. In addition, some grinders have several settings, so users can adjust the coarseness of the grind to suit their individual tastes. A bean to cup machine is likely to be a little slower delivering your coffee than, say, coffee pod machines, but when you’re going to be enjoying freshly ground coffee beans, that’s a small sacrifice to make. Perfection can’t be rushed, after all! All of the Melitta machines reviewed here offer dual cup dispensing. Some even dispense two milky coffees at a time – not something every machine offers. That makes catering coffee for a crowd faster and more sociable. All of the machines reviewed here, other than the Caffeo Solo, have integral milk frothers, whether manual or automatic. As seems obvious, the automatic milk frothers produce rich, frothed milky coffees with the press of a button. Manual steam wands require the user to learn how to use it properly to produce the luxuriously foamed milk you need for top-notch cappuccinos, lattes or macchiatos. And last, but far from least, the water. After the beans, water is the most important ingredient in coffee. With bean to cup machines, water comes from an integrated water tank, which in the Melitta range typically hold 1.8 litres. That’s ideal for producing a houseful of coffee. Water pressure and temperature are vital components in good coffee. All of these Melitta machines boast a professional level 15 bar pressure. Most of them also have variable water temperature, so coffee drinkers can set it to their taste, whether that’s cooler or hotter than the preset programmes. If you’re looking for a bean to cup coffee machine, the Melitta range should definitely be on your radar. With a wide range, there’s something to suit everyone’s needs. Now you’ve got the low down on this popular make, which is the one for you?